Outline: The story of Noah. God will punish our sins. Long ago the people of the world became very wicked. God said, "I must destroy them, because they are so wicked." There was only one man who obeyed God. His name was Noah. God said to Noah, "Preach to the people. Tell them I will send a terrible judgment to them. I will send a great flood because of their wickedness. Tell them to repent and turn from their evil ways." Then God said to Noah, "Build a large ship. When the flood comes, you and your family can go into it, and be safe." Noah began building the ship. (Pause 3 sec. for SE) All the time he kept telling the people about the great flood. They just laughed at him. (Pause 3 sec. for SE) They kept on in their evil ways. They did not repent. Then the time came. God said to Noah, "Gather your family and a male and female of every kind of animal, and take them (go with them) through the door into the ship." Oh! What a noise they made! (Pause 8 sec. for SE) Then God shut the door (SE Door). After this it rained and rained. (Pause 3 sec. for SE) The people knocked at the door of the ship. They called, "Noah! Noah! Open the door! Open the door!" (KNOCKING AND CALLING) But Noah answered, "It is too late. (The time is finished.) God has shut the door." The floods covered the whole earth. All the wicked people were drowned. But Noah and his family were safe in the boat. They did not die. Now, also, many of the people of the world are very wicked. They steal and lie. They gamble and cheat others. (List local sins.) They do these and many other bad things. Their sins have separated them from God. But God is calling them to repent. He wants them to come to Him. But many do not want to listen. God is holy. He hates evil ways. He will punish our sins. Another judgment (punishment) is coming. This will be much worse than the flood of Noah. In Noah's time, God judged with water. Next time God will judge with fire. God is going to put all wicked people into Hell. But God loves us. He has provided a way of escape. He Himself came to this earth. He became a man. His name is Jesus Christ. By dying for us, He took our punishment. He opened the door for us to return to God. If we follow Him, we won't go to hell. 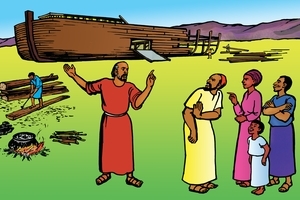 Noah's family went into the ship and were safe from the flood waters. Jesus Christ is the place of safety for you. Turn away from your sins. Confess them to Him. Follow after Jesus. Say to Him, "Oh, God, I have done many sins. Please forgive me. Save me from the great judgment. I believe in Jesus. I will obey His words." Talk to Him like this from your heart; then follow Him always. Then you will be safe from the eternal fire after death. Sound effects: building, laughing, animals, door shutting, rain. GRN has recorded a version of this script in 1479 languages and dialects. See full list.